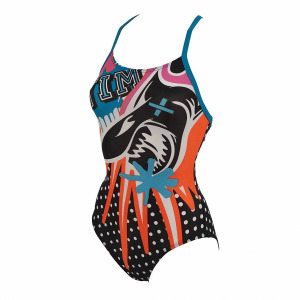 The Arena ladies Espresso swimsuit features a multicoloured espresso pot design. It is manufactured from Max life material for long lasting performance and comfort. This material is chlorine and abrasion resistant for great resilience and perfect fit. This model is not lined (it is also available in a lined version) and has a high cut leg. The ‘challenge’ back looks ultra stylish and feminine whilst remaining sporty. This makes the Espresso an ideal suit for training or holidays!